Increase your confidence and self-esteem and drastically change your life for the better. Increase confidence today. What Do Confidence, Self-Esteem and Success Have In Common? If you’re looking for a confidence booster shot and a heavy dose of self-esteem, then this course is for you. Do You Know The Hidden Causes for Low Confidence? Let me show you how to unlock lasting confidence that is based on your authenticity, not some learned technique. Self-esteem and confidence are the keys to unlocking what you truly desire in this life. You may think that if you were just more beautiful, more handsome, had more money, were skinnier or more fit, then success would be yours, then the girl or guy would be yours, then the promotion would come to you, etc. While all these things are nice, they are not the key to skyrocketing confidence! Outward beauty and money are not the key to lasting confidence. In fact, some of the most confident people are not the most beautiful people, at least not according to the media’s standards. Public speaking used to be my all-time biggest fear. So big in fact that I would have preferred to die. Perhaps you can relate? Thankfully, that’s all in the past! Today I have over 12,000 students worldwide, over 25,000 YouTube subscribers, I have also spoken with Robert Kiyosaki (author of Rich Dad Poor Dad) in front of thousands of people. I’ve been a Learning Annex instructor for many years and I’ve taught in-person workshops for the last 12 years. So how did I make the switch from soft spoken and shy wallflower to confidence rockstar? That’s what this entire course is all about! If you’re looking for more success in life, whether it’s personal or professional success, this course can help unleash the fearless ‘you’ that’s waiting to shine and sparkle. You will know the true source of lasting confidence. You will know the difference between true confidence and arrogance. You will receive many exercises throughout the next 30 days to increase your levels of confidence and increase your self-esteem. You will receive several guided visualizations to helping you program your subconscious with confident-building messages (I'm a certified hypnotist). You will know EFT and how to use the 'tapping' method to release issues that are holding you back from being a truly confidence person. You will receive several exercises to helping you building your public speaking abilities. You will receive guidance and exercises to helping you improve the quality of your voice. Nothing shows lack of confidence like the sound waves of your voice! You will learn the "kindness exercise" to help you increase your own confidence and self-esteem. You will learn how to set boundaries and become more assertive. You will learn how to stop procrastination by practicing a special 'tapping' session. You will know exactly what areas you are confident in and what areas have room for improvement.You will receive exercises related to worthiness. You will learn several power positions that will help you become a physically more confident person. You will have access to a Resource Library that lists many resources to helping you stay in the flow of confidence. WHO SHOULD TAKE THIS COURSE - WHO SHOULD NOT? This course is for anyone who wants more confidence and/or self-esteem.This course is appropriate for all ages. This course is for everyday people as well as professionals. This course is for men and women from all walks of life. This course is for left-brained as well as right-brained individuals. You will learn about confidence around financial success. This course is for anyone interested in personal development as well as the evolution of their soul. This confidence course is like none other you have ever taken. Come with an open mind and an open heart! Be prepared and willing to do some work. There are plenty of exercises in this course, all geared to helping you increase your confidence and self-esteem. "This course is chock full of information in a way that is easy to understand and incorporate. I learned very grounded information about the spiritual component of self esteem in addition to the importance and character. Having taken this course to better serve my clients has actually benefited my own well being! I would suggest this course for anyone as a foundation for building a life of inner strength & even clarity. Congrats & THANK YOU on yet ANOTHER Life Class that was clearly created with heartfelt wisdom, experience, intelligence & knowledge!" "Cha~zay has a way of teaching that is down to earth and with compassion. It is very obvious that she cares about people and wants to help. I love the way she speaks and how she sets up you up right from the start of the class to be successful." "You inspired me to use the mentioned techniques help improve Confidence and self esteem." I grew up in a middle-class family in Switzerland and later moved to the United States to learn English. I quickly caught on why the U.S. is called "the land of opportunity" and my entrepreneurial side came to the surface. I started a brand new career building teams for European-based technology companies who wanted to settle in Silicon Valley. In the late 90s when the dot-com became the dot-bomb, I decided to leave the corporate world to build a multi-million dollar real estate development and coaching firm. 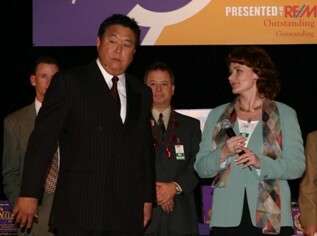 I taught at the Learning Annex for many years and spoke on stage with Robert Kiyosaki, author of Rich Dad Poor Dad, in front of thousands of people. Public speaking used to be my biggest fear. I resorted to teleseminars because it provided the distance and 'safety' I needed between me and my audience. Little did I know that I had stumbled on a gold mine. Once I gained enough confidence to lead successful teleseminars, I was asked to speak in front of live groups. The groups became bigger and the impact more exponential. Today I have over 33,000 students worldwide and it all started with teleseminars. This Teleclass Leader Certification course is the result of my journey so you can create your own success story. Enjoy! What's The Difference Between Confidence & Self Esteem? The Difference Between Motivation & Inspiration? Are You Looking Your Best? Public Speaking - Is It All Just For Show?